Mike, the Big Ten really shouldn't be giving you this kind of a headache, should they? I usually try to shy away from college football bloggitysphere topics du jour, since 1. said topics usually don’t have much to do with Auburn 2. everything I’d have to say has usually been said by someone already. Conference expansion. I wrote not long ago that the Big Ten would expand to 16 teams “when cows build a supercomputer that runs on cud.” While I’ll still be genuinely surprised if the Big Ten actually pulls the trigger on becoming FrankenConference, admittedly, it does now appear more likely than the cud-computer thing. And as a result, Mike Slive is firing warning shots of his own and sending the always-excitable hypothetical SEC expansion chatter into overdrive. 1. You’ll notice that as much as he might pretend otherwise, it’s the Big Ten that’s taking the initiative here and the SEC that’s threatening to respond, the much-maligned Jim Delany as the proactive agent and the SEC’s visionary Mike Slive as the reactive. That doesn’t automatically mean that Delany’s on to something–going to 16 teams by adding various Big East refugees and Missouri isn’t much of a coup–but it does point to something that Delany’s already done right and that Slive’s done wrong. When it comes down to the bottom line, Nebraska couldn’t afford not to leap at Big Ten money — and that’s even more true for potential expansion targets Missouri, Pittsburgh, Rutgers, et al, which stand to gain even more from a move than Nebraska. That, in a nutshell, demonstrates the wild success of the Big Ten Network, beyond what anyone outside the conference imagined when the idea was floated in 2006 — the general reaction then, if I recall, ran along the lines of “Who wants to add 60 cents to their cable bill to watch Purdue volleyball?” Less than four years later, the BTN is already the giant in the room in the Expansion Chronicles, without which the likes of Nebraska and Missouri (and Notre Dame, to the extent the Irish even remain in the discussion at all) would have no practical incentive to abandon their century-old rivalries in the Big 8/12. In fact, the BTN is in all likelihood the catalyst for the Expansion Chronicles, because a growing beast must be fed new cable markets to ensure its annual allowance of revenue. Whether or not it was founded with imperialist ambitions, the network was a farsighted, far-reaching stroke that has already put the Big East essentially at the Big Ten’s feet and cast much longer shadows than anyone could have imagined across the Big 12, a demographic lightweight when it comes to potential television audiences. For all the chuckles that greeted its inception, the BTN is now an 800-pound gorilla in the room of college football, potentially capable of pulling the proud likes of Nebraska into the Big Ten fold via the flexing of its cash-flush muscle. How flush? Already each Big Ten team is raking in some $22 million per year in TV money–$5 million more than each SEC team–and that’s only two football seasons into the BTN’s tenure. The much-ballyhooed deal the SEC struck with ESPN isn’t bad, isn’t bad at all. But it’s for 15 years. Yes, $17 million a year is a lot of money in 2010. But how much is it going to be in 2022? And how much is the Big Ten going to be pulling in by that point as the BTN slowly, inexorably grows … while the SEC contract stays the same? That $5 million gap today might look like chump change by then. One of these two conferences is considering expansion because it took a smart risk and in so doing, positioned itself for growth. The other is considering expansion because it passed on that same risk, locked into a long-term contract that served its immediate needs rather than its future ones, and now might be forced to play catch-up. 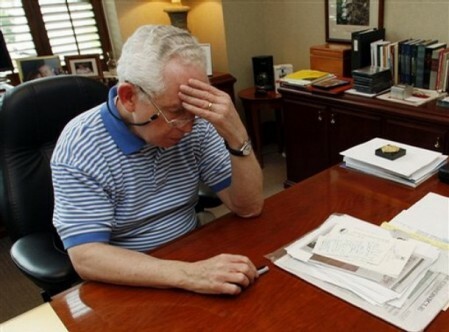 In all other facets of running a major college athletics conference, I’d take Mike Slive over Jim Delany in a heartbeat–but negotiating the league’s television contracts is arguably the single biggest fact there is in the conference commissioner “profession” these days, and in this facet Delany has served Slive his head on a platter. 2. Because of the above situation, I’m well aware that if/when it comes to it, Texas will be SEC expansion option 1, 1a, 1b, 2, 2a, 2b, and 3. (3a is also Texas, but football-only.) Too bad I don’t want the Longhorns in the conference. I know it would be good for the league’s coffers, media profile, big-game-scheduling frequency, all that stuff. Arkansas would have a natural conference rival, finally. It would even give LSU one of their genuine old-school rivalries back when Texas A&M tagged along. It would be a slam dunk in every tangible way, and that’s why Slive will do everything he can to make it happen if he has to. But me personally, I can’t get over the intangibles. The SE in SEC has always meant something to me–that Auburn’s conference was the conference of the bayou and bluegrass, panhandle and palmetto, Music City and Magic City, with no weird geographical interlopers involved. (Arkansas sort of came close when they signed up, but the insanity revolving around the Houston Nutt years proved the SEC was the Hogs’ spiritual home all along.) Maybe the far eastern Texas coast would qualify, but most of the state–Austin included–has as much connection to the Southeast as a six of Shiner Bock. On top of that, dynamics of SEC competition that have been in place for decades would be dissolved in a flash. Deciding our champion in football has always revolved around the great rivalries–the Third Saturday, the World’s Largest Cocktail Party, the Iron Bowl, Tennessee vs. Florida in the Spurrier/Manning years. The title used to go through Ole Miss and Georgia. Then it went through Alabama, then Florida. Now, the Tide and Gators seem to sharing things. The introduction of Texas would change that irrevocably; barring a strange collapse in Austin from Mack Brown’s successors, now the title is decided by LSU vs. Texas, ‘Bama vs. Texas, whether the Longhorns could survive trips to Jordan-Hare and Oxford and Knoxville. For everyone besides the Razorbacks, it would be–in a word–weird. It’s one thing to invite a new team into the fold; it’s another to invite one who has the chops to dominate the league from its first day, especially when it’s something less than a perfect geographic and philosophical fit. The right move from my personal perspective is to expand inward–to bring Georgia Tech back, finally unite with Clemson, let Florida St. make up for that dumb-assed 1992 decision. Your mileage is welcome to vary, but the SEC I’ve known and loved is still the same SEC with the Jackets and ‘Noles around; with the Longhorns and Aggies, it’s something else. You know, I’ve always loved the writing here and the little references you place in here. But I LOVE the fact that you referenced Shiner here. Shiner Bock is by far my favorite beer. That being said, I’d rather see GT back in the SEC as well. It would be great to revive that old rivalry. There are a lot of other logical choices than Texas, even though Texas will probably still be the first choice no matter what. I appreciate your concern, but I just don’t think Texas coming to the SEC is very likely. They’re so big that all other Texas schools are in orbit around them. It would be easy for Texas to take whatever’s left of the Big-12 after Missouri or Nebraska leaves, scoop up TCU and/or SMU, and form their own strong regional conference. In addition, Texas receives a disproportionately sized share of Big-12 revenue. That’s a sweet deal that wraps the Longhorns in cotton wool and certainly won’t be on offer from the SEC. Next, Texas is a state school. If it left the Big-12, Tech, Baylor, A&M, and everyone else in Texas would be sucking wind. I really doubt the Texas legislature would allow such a thing to come to pass. Finally, the cultures are a terrible fit. Longhorn fans are about the lamest fans I’ve ever seen. I’d never seen a stadium clear out with the game’s outcome in question before I went to a Texas game. You see it all the time in Austin–during conference play. Texas doesn’t want the SEC, it won’t be let into the SEC, and the SEC really doesn’t want Texas. The whole numbers game gets more and more confusing every time I think about it. Like, okay, so, the Big Ten Network rakes in tons of money. But how much more money can it bring in by adding five more teams? Like, there’s got to be a threshold somewhere where it all reaches a cap, and it’s not proportionate any more. But then again, maybe not, seeing as in a lot of cases the only people that watch college football games are the fans of the teams that are playing. But, like, for example, the BCS games. No matter how many teams you add, no more than two teams are going to make it to BCS bowls each year on a regular basis. And now, instead of splitting two BCS paydays 11 ways, you’re splitting them 16 ways. I’m not an expert on the numbers — is that shortage just so insignificant that it doesn’t really matter against the television profit? Do conferences pool up and split other things, like merchandise? But as far as the stuff I do get — that is, everything about this except the money — I agree with you. I’ll take one of the ACC guys over Texas any day, frankly. Texas would just bring in a kind of unwelcome change. And I don’t see how they would be any more beneficial to the conference than an ACC team. (Unless, that is, things like merchandise ARE pooled up and split by the conference.) To some, ACC guys like Florida State and Georgia Tech might not seem like appealing additions right now in the present time, but if we did add them, and then allowed them a few years in the conference to rebuild their brand name, they’d be caught up with the big six in no time. Anyway, I think we’ll be aight, no matter what happens. I’m not really worried about what the Big Ten or Texas or Notre Dame or anybody’s doing. But I am a bit worried that our conference might get crazy and make a hasty mistake in trying to respond. If I look at the ESPN/CBS contracts like coach’s contracts then It will be in flux, that is to say something that can be counter bargained with drawing power from say Orlando, FL or Austin, TX, or the ATL. markets. I could not see ESPN letting an insignificant thing like money, keep them from tapping these markets for Thursday, Saturday, or Sunday night games. When the NFL is not playing, these markets could be owned by ESPN with a premiere SEC event, especially one that could affect the conference each respective team plays in, if they belonged to the SEC. I personally have mixed feelings about Texas in the SEC, but am not opposed to it. Despite the fact Texas could come in and take over the SEC west, having to do that drive from Athens to Austin is a sonofab*tch. Believe me, I’ve made it several times for sxsw. Adding any school that takes longer than a day to get to (which it would be for SCar, Florida, Georgia…and pretty much all the SEC East fans) is kind of a nightmare. Call me a homer, but I still think the ESPN deal will be better for the SEC than the Big 10 Network. Having ESPN force feed SEC sports across the country will be better for the conference as far as reputation and name recognition than having a random cable network. It might be less money in the short term (calling 15 years short), but think about the position of the SEC 15 years from now after having been saturated in biased coverage from the talking heads at ESPN all those years. It’s what we’ve always dreamed of! Then we can start a network. Or charge ESPN even more. Either way, I still think we will be in a better situation than the Big 10. I, for one, would love to see some 16-team conferences begin to form. But I’m thinking more in terms of it leading to post-season reform. For a few years now, I’ve been trying to get someone/anyone to listen to my plan involving eight 16-team conferences*, generally formed in accordance with current conference and rivalry alignments, which each have a championship game at the end of the season and send their ONE winner to an 8-team playoff while all the other teams, still ranked to keep the AP and USA Today/Coaches happy, get to play in bowl games. SO this current expansion talk would seem a logical first step – let the major conferences start to form their own 16-team allegiances and allow everyone else to follow suit when they realize they won’t have a shot at a championship if they don’t have their own similar system. * – I realize this would work out to 128 teams, so… we’d have to pull some up from the current FCS or something. Whatever. Don’t question my math. I know there’s zero chance of this, but I wish the SEC would take UNC, NC State and Duke (and Tech)… just absolutely gut the ACC as a result… the SEC would be the premier Football and Basketball school. An interesting side note about the BTN, I live in Belgium, and on Sundays in the fall, we get one Big Ten game on a random network over here. I thought it was really odd the first few times I saw it (especially since it was Northwestern the first couple of times), but I guess they have the footage, and can sell it cheap! For all the hungry looks that the Big 12 is getting from cannibalistic conferences like the Big Televen and SEC, I believe the other inevitable casualty of this trend will be the ACC. It crosses too many natural boundaries of other conferences to survive the feeding frenzy that will likely result from a Big Ten expansion. The result will be yet another separation from the rest of the pack in the form of four ‘super conferences’ (based on core conferences) of Northeast (Big East), Midwest (Big Ten), Southeast (SEC) and Far West (Pac 10) that will vie for the National championship. All other conferences will be relegated to non-BCS bowls and ‘second league’ status. Just my impression, you understand. Cool thread, guys. Sorry I haven’t weighed in yet. Re: Texas, I agree it’s unlikely they’ll find a deal in the SEC they like better than their current sweetheart package in the Big 12, one that would only get better if Nebraska/Missouri/Colorado left and were replaced by TCU/Houston. But I have to think that’s the first place the SEC would ask, anyway. Too much $$$$ involved not to make the request. Re: AO’s question about money, I think there very well could be a point of diminishing returns where revenues are split too many ways. But for now, clearly the thinking is that if you’ve got a network, the more markets you can wedge that network into, the better the advertising rates, the more money you earn. If the Big 10 does go to 16 and it turns out the profits just keep rolling in, what will the SEC’s position be if it doesn’t respond quickly? Yeah, _I_ think they’d be fine, but that’s clearly not what Slive is thinking. Re: the SEC’s TV contract, I don’t see ESPN renegotiating it. The SEC signed it, the SEC has to live with it. And sorry Michael, I could be wrong,I don’t think it’s better than the BTN–the Big Ten still gets its biggest games on ABC/ESPN, it just earns WAY more from their lesser games than the SEC does shuffling games off to ESPNU and the like. I haven’t really seen the “SEC dominates the media via ESPN” effect a lot of people expected when the contract was signed last year. I guess we could still see it this year, and the next, but as of today the BTN is the superior option. It doesn’t make the Big 10 the superior conference, but if they money gap only widens over the next few years, it could help dramatically close the performance gap. It’s worth reiterating that I don’t _want_ a 16-team conference, by any means, and I honestly wonder if the Big 10 really does, too–this could all be a Machiavellian ploy to intimidate the Big East into pitching Notre Dame overboard in all its non-football sports, at which point it would have no choice bu to come crawling to the Big 10.